Two volumes (31.5 and 37 cm), I: 104, lxxix (9) pp., including 1 tipped-in colour plate. II:  pp., including 94 tipped-in colour plates. “Nota para la colocacion de los retratos” tipped onto endpaper. Harmonious leather bindings. - Photolithographic reproduction of the manuscript Libro de retratos (Biblioteca de la Fundación Lázaro Galdiano. Signatura: M 6-1; Inventario: 15654), together with a commentary by the scholar and owner of the manuscript for some 40 years, José María Asensio y Toledo (previously published at Seville in 1867). 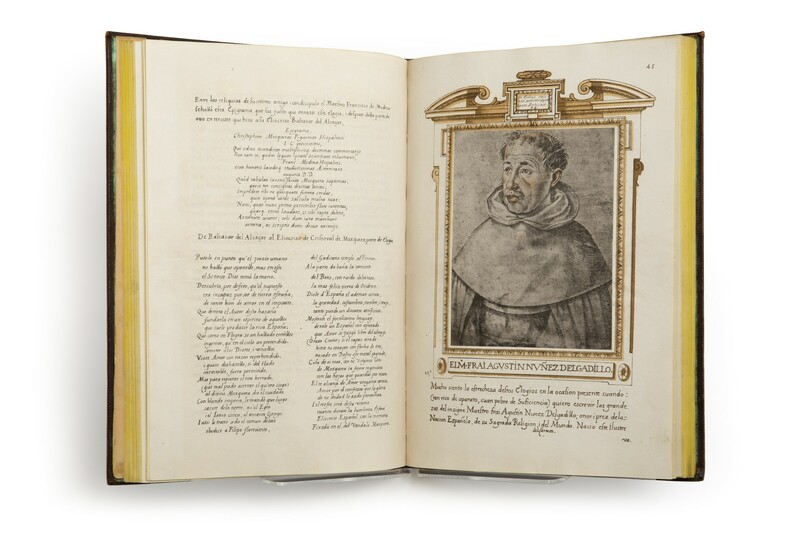 The manuscript contains fifty-six bust portrait drawings in black and red chalk and grey wash and forty-four “elogios”, short biographies, written by Pacheco or other writers, in honour of contemporary, “illustrious and memorable” men. The subjects portrayed are all Spanish with the exception of the Flemish painter Peter de Kempeneer; work on the book probably began late in sixteenth century (the frontispiece is dated 1599). On the methods and techniques of reproduction used in this facsimile (produced 1881-1884), see Juan Carrete Parrondo, “El Libro de retratos de Pacheco” in Goya 193-195 (July-December 1986), pp.168-173. Marta Cacho Casal, “The ‘true likenesses’ in Francisco Pacheco’s Libro de retratos” in Renaissance Studies, volume 24 (2010), pp.381-406. ¶ Ink stamp on first leaf on each volume: Manuel de la Puente y Cueva | Sevilla. Hinges of volume II reinforced, endpapers discoloured. (31.5 cm), 104, lxxix (9) pp., including 1 tipped-in colour plate. “Nota para la colocacion de los retratos” tipped onto endpaper. Contemporary leather-backed boards. - Originally issued at Seville in 1867 (Litografía y Libreria Española y Extrangera de José M.a Geofrin). ¶ Ink stamp on first leaf: Manuel de la Puente y Cueva | Sevilla. 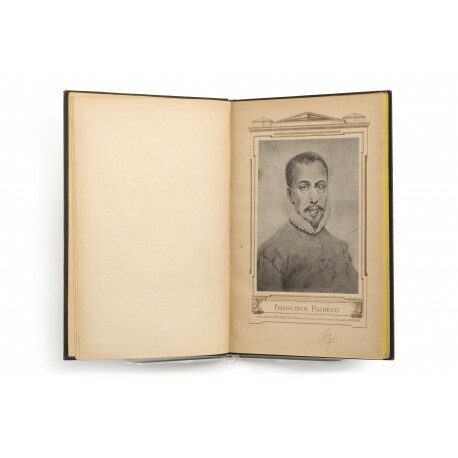 (37 cm),  pp., including 94 tipped-in colour plates (title-page and portraits). “Nota para la colocacion de los retratos” tipped onto endpaper. Contemporary leather binding. 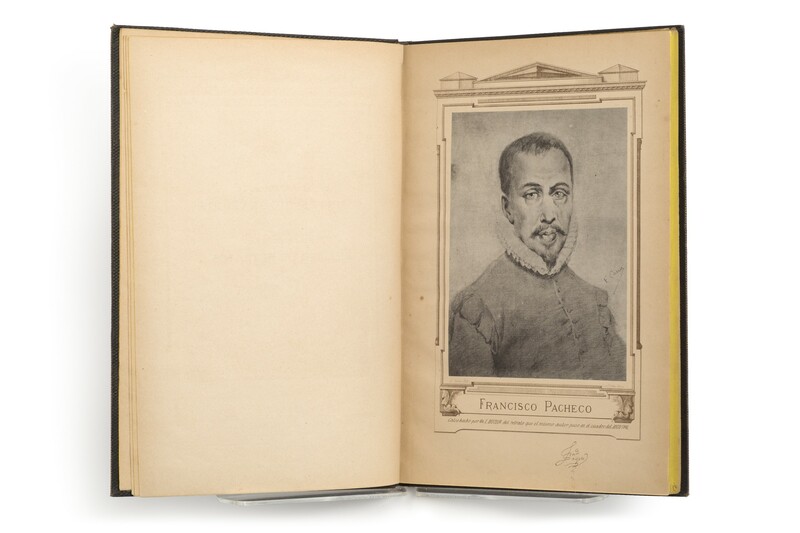 - Facsimile of the painter Francisco Pacheco's manuscript book of portrait drawings and eulogies (Madrid, Museo Lázaro Galdiano, Inv. 15654). ¶ Ink stamp on first leaf: Manuel de la Puente y Cueva | Sevilla. Hinges reinforced, endpapers discoloured.